The USSA Adult Day Center of Portsmouth is celebrating diversity with National Adult Day Week September 17-23. The center, functioning as the only adult day center in Scioto County, operates weekdays between 8 a.m. and 4:30 p.m., with their mission being to add meaning and dignity to life through activities and companionship for those ages 60 and older. The center serves a wide variety of clients, each one stemming from very different backgrounds and having lived through their own share of circumstances which have shaped them as individuals. 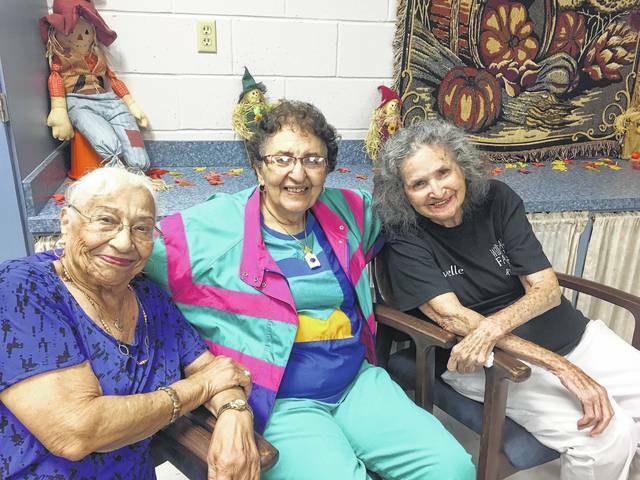 Three women in particular, which are regular visitors to USSA Adult Day, began their life’s journey hundreds and thousands of miles away from Portsmouth, yet have found themselves here to continue their personal growth well into their golden years. Julia Ferreira, who will be celebrating her 90th birthday in January, was born in Puerto Rico. She moved to Scioto County two years ago, after spending several years living in a big city. She often reminisces on her time as a young girl living in Puerto Rico, immersed in the familiarity of a Spanish culture and its fast-pace music and traditional food. “I can’t get used to the food here, I miss my Puerto Rican food,” Said Ferreira. Ferreira otherwise described her time in Ohio as a wonderful stage in her life. “I’m hoping that god will help me to live the rest of my life here,” said Ferreira. As for the day center, Ferreira shared her favorite things about her time spent there. Margherita Gleason, 78, grew up in an orphanage in East Africa. She moved to America in 1969, where she then started her family and raised her four children in Scioto County. Gleason worked hard to support her family, working as a housekeeper for many years and became very involved in the community and with her church, despite overcoming struggles since the age of 5. For Margherita, the Day Center is a way to pass the time with good company. Ninety year old Lela Love Vinia Avelle Williams-Abrams, who goes by Avelle, was born in Alabama in 1927 and moved to Georgia in 1951. Abrams had visited Ohio many times during her life, making it a home away from home before moving here with her Daughter in 2003. Abrams looks at the Day Center as a place where she can go to enjoy herself and socialize with her friends. Although each woman came from drastically different places, they each reminisced on similar memories of going dancing in their youth, listening to their favorite music, and being in the places where they grew up. The USSA Adult Day Center will be hosting an open house on Thursday, Sept. 21, during regular business hours for anyone interested in joining their community.